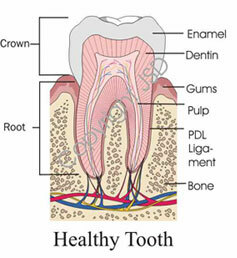 Following dental school, endodontists receive two or more years of advanced education in this kind of treatment. They study root canal techniques and procedures in greater depth for diagnosis and treatment of more difficult cases. For this reason, many dentists choose to refer their patients to endodontists. A local anesthetic will be given to thoroughly numb your tooth. A sheet of latex or non-latex called a "rubber dam" will be placed around the tooth to isolate it, hence keeping it clean and dry during treatment. 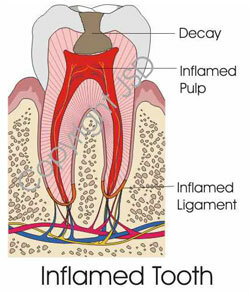 The infected or inflamed tissue is then removed, and a filling material is placed into the canals. The number of visits will depend on your particular case. Some treatments may take two visits, but most are just a single visit. Occasionally, three visits are needed. For the first few days after treatment, there may be some sensitivity to biting pressure, especially if there was pain or infection before the procedure. Sometimes, over-the-counter anti-inflamatory medications live Advil are recommended for a day or two. Dr. Tagle and Dr. Leiendecker can prescribe other medications if they are required. Click on this link to watch a video regarding endodontic treatment. When your endodontic therapy is complete, Dr. Tagle or Dr. Leiendecker will explain whether or not your tooth will need additional treatment at your general dentist's office. We would like to see you in our office six months to one year after completion of the root canal treatment to ensure that the tooth is healing properly. There will be no charge for this follow up visit, and you will be contacted when we feel it is appropriate to check the area. Click on this link to watch a video discussing retreatment. Root-end surgery, also known as an apicoectomy, is a procedure performed for canals that may not be accessible or have had previous unsuccessful treatment.